Is Portand’s livable quality getting better? If you’re an architect, maybe you think so. For others, not so much. Portland 1917 and 2017. We designers need to ask ourselves tough questions: is this really getting better? By whose judgment? How are those judgments made, and under what biases? In the last decade or so, a new fashion has come to dominate Portland’s architecture and planning circles. We might think of it as “Little Vancouver” – aggressively modern buildings, often tall or bulky, surrounding well-manicured landscapes of public space. The buildings are often extravagant, artfully expressive, and sometimes darlings of architecture critics. In Vancouver BC, former planner Larry Beasley referred to that city’s approach as a version of New Urbanism. But we might also regard them as a modestly more urban reincarnation of the “Towers in the Park” formula of the 1930s utopian architect Le Corbusier, or other varieties of the same modernist movement he championed. Some of the elements of New Urbanism are tacked on — some mixed use, some transit, some green features. The trouble is, Le Corbusier’s modernist utopia — embraced enthusiastically by the likes of General Motors and the freeway-building Robert Moses — did not quite work out as planned. Around the world, it ended in dystopian landscapes of functionally segregated, resource-guzzling proto-sprawl. This was the regime eviscerated by critics like Jane Jacobs – herself a darling of Portland planners of a generation ago. So it’s curious that many Portland architects and planners now seem persuaded that this new-retro approach is a wonderful thing. This time around, we will get more density as a result of these buildings, and that adds to sustainability. Even better, we will be able to install wonderful new “green” technologies on and around these buildings. The buildings will be stylish canvases for our contemporary artistic expressions. And we can use the high profits from these buildings (and their increasingly wealthy buyers) to set aside affordable housing, save some historic buildings, and even create some new public space (Director Park is a proudly cited example). This is a good industry for the city, fueling jobs and improving its attractiveness. What a deal! It’s all good, right? Unfortunately the research evidence (to say nothing of a half century of other sad evidence) does not bear out this optimism. In fact, studies show that tall buildings have up to 60% more embodied energy than lower ones – and that’s on top of the signific ant embodied energy investment required to build a new building, in relation to an adaptive reuse of an existing building. But we’re getting fewer adaptive reuses, thanks to a massive wave of tear-downs to make way for new buildings. Other critical evidence flies in the face of claims. Many green buildings do not work out as planned, and the claim that density is automatically a guarantor of sustainability is simplistic at best. Greater affordability does not automatically come with additional units, as Vancouver has demonstrated. Real estate does not obey the simplistic laws of supply and demand; location is a critical variable driving cost. So is height. Put simply, it matters where you build, no less than how much you build. So why is it that our architecture colleagues — a community to which the two founders of this blog belong, we should note — seem so credulous and so immune to the evidence, not only of research but of ordinary experience? Why is the gulf so big between what architects and planners judge to be good buildings, and what pretty much everybody else thinks? More pointedly, why, on the best evidence, are we slowly but persistently destroying the livable quality and heritage of Portland, with the best of apparent intentions? A similar cognitive bias is explained by what is known as “construal level theory.” Architects and planners, having a psychological distance from the actual lives and experiences of people within their buildings and landscapes, must “construe” the criteria that they deem to be of value. Often these criteria are at odds with the values and concerns of actual citizens and residents, and the architects often focus instead on the more exotic and precious concerns of other architects — formal manipulations, witty professional references and the like. But these issues bear little relation to the actual quality of life of citizens — and in that there is a troubling question of professional ethics. In short, what is the purpose of architecture, beyond its capacity to please architects and their connoisseurs? Another factor is more prosaic — the role of architects as marketers for large-scale industrial developments. In effect we become packagers of a product, and our irresistible “packaging” is our art, combined with the expert allure of our universities. You might like the result because it’s shiny and new. If you don’t like it, you are a “philistine,” who doesn’t appreciate good art, or expert intelligence. This we shut down debate by imposing our expertise, and spurning more robust traditional alternatives as “pastiche,” “kitsch,” and similar architectural curse words. But in such an economically dependent condition, it is hard for us to look critically at the source of our own livelihoods, and more tempting to continue the apologist narratives, helping to explain (to others and to ourselves) how benevolent it all really is. An image by the architects Rem Koolhaas, satirizing the chaos and the inanity of supposed “green” buildings in Dubai and elsewhere. “The work we do is no longer mutually reinforcing,” said the architect Rem Koolhaas, “to the point that each new addition reduces the sum’s value.” Perhaps that’s because, in our effort to create something marketably exciting and new, we have lost the coherence and beauty of good human environments with robust natural qualities, of the kind we can see all around us — including in Portland’s own history. Well, whatever we do, we mustn’t copy the past, according to the most egregious self-serving tenet of the faithful. Yet our ancestors practiced just such a revivalism repeatedly — in the Arts and Crafts, the Renaissance, Georgian London, 19th Century Paris, and thousands of other periods and places — and it produced some of the most successful, most loved, most long-lasting and sustainable places in human history. But whatever we do, we must never, ever build anything like them again? Instead, we are told, we need buildings “of our time.” It seems we deserve to be punished with crappy environments – but at least they are “modern”. Thankfully, the research evidence clearly points out such cognitive follies, which are the results of systematic errors of thinking. We can see these biases and illusions at work in the fascinating research of psychologists like Daniel Kahneman (the subject of a new book by Michael Lewis) and the “bounded rationality” described by Herbert Simon and others. This rich and growing field offers us much to think about. The question is, can we use these insights to break open our own illusions, and begin to see more clearly how Portland can be a truly better city? A new proposal for a tall modernist building in Goose Hollow, a historic low-to-mid rise neighborhood in Portland. The project presented at a February neighborhood meeting by Mithun Architects, and other members of the development team. The project goes before the Design Commission on March 23rd, 2017. “Portlanders will vote in May whether to strengthen the independence of the elected auditor who oversees Portland’s Independent Police Review Division and evaluates the performance of the city’s bureaus. “The Portland City Council voted unanimously Wednesday (Feb 1) to put before voters changes to the city’s charter that would give the auditor greater independence over spending, hiring and legal decisions. City Commissioner Dan Saltzman introduced an amendment that would greatly weaken the Auditor’s proposal, placing the Ombudsman’s role in City code instead of the City Charter. That amendment failed 4-1. The Ombudsman earlier found undisclosed potential conflicts of interest in a key City of Portland Stakeholder Advisory Committee. That committee, the West Quadrant Plan SAC, was advising the City on real estate development deregulation, as part of the Central City 2035 Plan. The Ombudsman found that members of the SAC are public officials under ethics laws, and that the City erred in not requiring such disclosures. The Saltzman family is also known to have a number of development interests around the city. 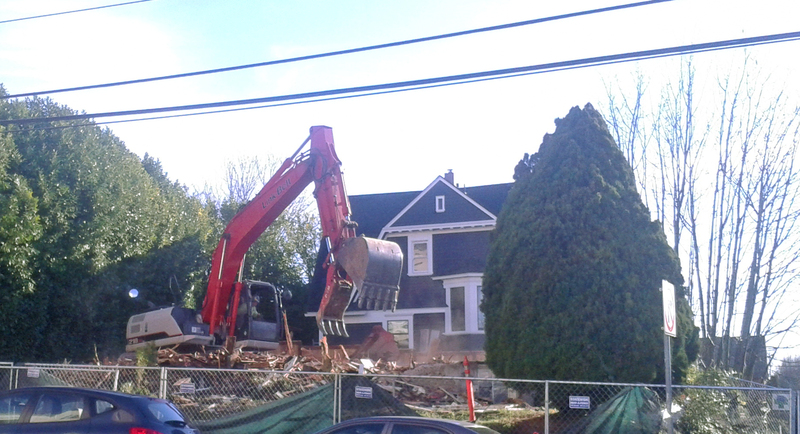 The Portland Chronicle has listed the 376 homes that were demolished last year, many in close-in neighborhoods with historic fabric. The Chronicle also notes that the year before, 326 homes were demolished. That is a pace of about 3,500 homes per decade. Is this destruction needed to accommodate new growth, as some claim? The evidence is not there. According to a housing supply background study done for the Portland Plan in 2010, infill without demolition could accommodate large numbers: “Construction on underutilized lots alone could add more than 120,000 units. ” An informal survey of the large number of parking lots and under-utilized sites across the city seems to confirm that enormous untapped capacity. Ironically, the homes are immediately adjacent to an empty parking lot. There are no known plans for development for that site.